While the NFL won’t give out its real awards until Super Bowl time, I will make my predictions for who will be receiving said awards. Only one thing is certain as of right now: the best of 2012 have a lot to live up to next year. It’s time, for me at least, to tell everyone who will win the awards in February and why. Defensive Rookie of the Year: Luke Kuehly not only led the 10th-ranked defense of the Carolina Panthers in tackles as a rookie. He led the entire division. He led the entire NFC. And just for good measure, he led all of the NFL in tackles as a rookie fresh out of Boston College. Kuechly, a 6-foot-3-inch, 235-pound linebacker, finished the season with 164 tackles, 15 ahead of NaVorro Bowman of the 49ers who had 149 on the year. He’s begun to transform the defense of the Panthers, which just last year, was 28th in the league. Out of the 17 defenders drafted in the first round of this past year’s draft, Kuechly was far and away the most productive. The next most was Bucs‘ safety Mark Barron, who had 89 tackles on the year. Carolina gave up 22.7 points per game in 2012 after allowing 26.8 last season. Kuechly was instrumental in holding strong offensive opponents like the Giants, Seahawks, Cowboys and Chargers to seven, 12, 14 and seven points, respectively. 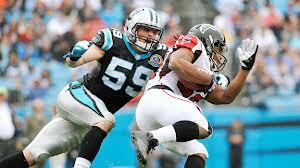 My 2012 Defensive Rookie of the Year: Luke Kuechly. 2012 Defensive Rookie of the Year: Luke Kuechly. Offensive Rookie of the Year: In a season that was definitely going to result in one of the first two picks in the draft winning this award, it just had to be determined whether it would be Andrew Luck or Robert Griffin III. 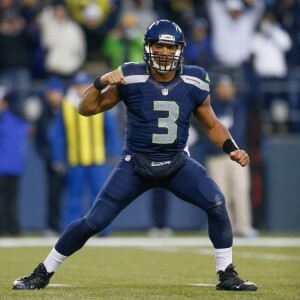 So, with that being said, my offensive rookie of the year is Russell Wilson. Wilson is just as much of a two-way threat as the other two and threw more touchdown passes than his two fellow rookie quarterbacks. In fact, Wilson tied Peyton Manning’s 1998 record for the most touchdown passes by a rookie with 26 on the year. In the month of December, when the games mattered most, Wilson quarterbacked a Seattle team that put up 150 points in a three-game span. And he didn’t even enter training camp as the team’s starter. His 69.6 QBR was eighth in the league, just behind Griffin and just ahead of Luck, while his 100.0 passer rating was fourth in the league, just behind Griffin and well ahead of Luck. Neither the Seahawks, nor the Redskins or Colts would likely be in the playoffs without their rookie quarterback, so it kind of came down to stats in making this decision. My 2012 Offensive Rookie of the Year: Russell Wilson. 2012 Offensive Rookie of the Year: Russell Wilson. Coach of the Year: What a year it was for the Colts. 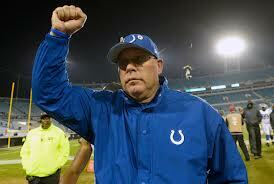 It takes a special coach to turn a 2-14 team into an 11-5 team and make the playoffs in the tough AFC South. It’s even more impressive that he did it in an interim role with all that must have been on his mind after head coach Chuck Pagano was diagnosed with leukemia in October. Bruce Arians took over the team and, under his direction, they never lost focus and were able to win 11 games. They became just the seventh team ever to win at least nine more games than they did the previous year. Pagano has since returned and will coach the team in the playoffs, but they would not be there without the job that Arians did. To keep the team composed under those unbelievably difficult circumstances and to actually succeed on the field at the same time is so impressive and incredibly unique. Some season highlights for Indianapolis included wins against teams like the Texans, Vikings and Packers. My 2012 Coach of the Year: Bruce Arians. 2012 Coach of the Year: Bruce Arians. The final week of the 2012 NFL season was just as good as the first 16 were. With 16 division matchups on the schedule, it had it all: shutouts, blowouts, third-string quarterbacks, elimination games, records being chased and of course another opportunity for Tony Romo to choke. (He did). For the last time in 2012, your storylines from the week that was in pro football. Eight would have been great: Minnesota running back Adrian Peterson came up eight yards shy of tying the single-season rushing record, but his Vikings are heading to the playoffs. Adrian Peterson came within eight yards of tying and nine of breaking the NFL single-season rushing record, but with time running out in the game, Blair Walsh kicked a 29-yard field goal to break the tie and send the Vikings to the playoffs, ending Peterson’s regular season. Minnesota defeated the Packers, 37-34, for their first win against their division rivals since 2009. The loss also ended Green Bay’s 12-game division winning streak. Peterson did become just the seventh running back to ever rush for 2,000 yards in a season as he concluded the regular season with 2,097 yards on the ground. The Packers had won nine straight regular season finales before the loss. Aaron Rodgers threw four touchdowns in a game for the fourth time this year, including two to Greg Jennings. Walsh added to his NFL record with his 10th field goal of 50-plus yards on the season. Peterson finished the season with seven 150-plus rushing games, tying the NFL record. Minnesota has made the playoffs for the first time since 2009. The Packers, who finished the regular season at 11-5 and the Vikings, who finished 10-6, will play each other on Saturday in the Wild Card round. The good news: the Colts won their regular season finale. The great news: Chuck Pagano was back on the sidelines to coach it. J.J. Watt failed to get any sacks and finished two shy of the NFL single-season record as the Texans lost to the Colts to fall all the way to the third seed in the AFC, missing the bye they had been in position for all season long. Watt finished with 20.5 sacks on the year. Houston has never won at Indianapolis – now 0-11 all-time with the 28-16 loss on Sunday. A career-long 70-yard TD pass from Andrew Luck to T.Y. Hilton on 3rd & 23 all but sealed the win for the Colts. Deji Karim returned a second-half kickoff 101 yards for Indy, their longest return since 1973. Andre Johnson tied the career record of 10-reception games set by Wes Welker last week with the 18th of his career. Reggie Wayne now has at least three catches in 64 straight games, extending his NFL record. The Colts became the seventh team to improve by nine wins in just one year, going from 2-14 in 2011 to 11-5 in 2012. Houston finished 12-4 after losing three of its last four games and will host the Bengals in the Wild Card round, while the Colts will travel to Baltimore. The Chicago Bears have made a little history of their own as they became just the second team since 1990 to miss the playoffs after starting the season with a 7-1 record despite beating the Lions, 26-24, in Detroit and finishing with a 10-6 record. They have now missed the playoffs in five of the last six seasons. Matt Forte did rush for 1,000 yards for the third time in his career. The Lions finished a disappointing 4-12, but Matthew Stafford shattered the previous record of 691 pass attempts in a season and finished with 727. Calvin Johnson caught five balls for 72 yards and came up 36 yards short of the first ever 2,000-yard receiving season. It broke his streak of eight straight 100-yard receiving games and four straight 10-catch games, which were both NFL records. 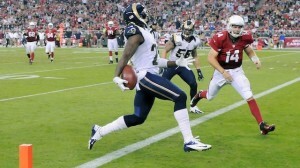 He finished the season with an NFL record 1,964 receiving yards. Chicago fired head coach Lovie Smith on Monday after a 3-5 end to the year and that has apparently prompted kick returner Devin Hester to consider retirement. Through the first eight games of his NFL career, Colts quarterback, Andrew Luck, has thrown for 2,404 yards and helped his team win five games. There was a lot of pressure on the Colts coming into the year. I mean a lot. For starters, they won just two games last season and were winless through their first twelve. On top of that, they parted ways with one of the greatest quarterbacks of all-time to move on to their quarterback of the future. As a rookie quarterback in the NFL, No. 1 draft pick and successor to Peyton Manning, Andrew Luck has been forced into learning a little bit about living up to the hype. After leading Stanford to a 30-8 record in three seasons and racking up two second place Heisman Trophy finishes, Luck is rolling with the big boys now – even though he already was one in college. Luck passed up the No. 1 overall pick in 2011 to return to Stanford for his senior season and develop even more skills as well as get his degree. When his college career was finally over, he had thrown for 9,430 yards and 82 touchdowns in just three seasons. Then, on Thursday, April 26, 2012, Luck began the next phase of his football career. He was officially drafted first overall by the Indianapolis Colts to be their immediate starting quarterback and replace one of the icons of professional football, Peyton Manning. As a rookie, he has completely bought in to the Colts’ way. His leadership and work ethic are both already much further along than they should be at the young age of 23, which he turned just three days after the start of the season. If that wasn’t enough, he even recently shaved his head in support of coach, Chuck Pagano, who has been battling cancer for much of the season. His first test as a pro came against the Chicago Bears and their crazy good as well as experienced defense. Luck looked all right, but his performance against what would turn into the top defense in the league in 2012 reflected that of a rookie. He threw three interceptions and just one late touchdown when the game was already out of reach in his team’s 41-21 loss on opening day. The team went 2-3 through the first six weeks of the season with losses to the Jaguars and a 35-9 demolishing to the struggling Jets. They did, however, beat a couple of playoff contenders in the Vikings and the Packers. Luck did throw for 1,208 yards in the first five games (241.6 ypg). It was just a matter of really finding some consistency. With the Jets game behind them, the Colts would be staring at some favorable match-ups in the coming weeks. A Week 7 game against the Browns with fellow rookie quarterback, Brandon Weeden, and Week 8 at Tennessee provided the Colts with a chance to turn things around. And Luck did just that. With his team trailing late in both games, Luck engineered back-to-back game saving drives that ended up resulting in wins. His game-winning touchdown pass in Week 8 beat the Titans, got Indy to .500 in the division and pushed them over .500 overall for the first time since Manning had left. Week 9 was more of the same as the Colts grinded out a 23-20 win over the hot Dolphins. Luck threw for a rookie record 433 yards in the win and mixed in two touchdowns with no interceptions. Through eight games, Luck has thrown 10 touchdowns to just 8 interceptions. Through eight games, Luck has thrown for 2,404 yards which is exactly what Manning had through his first eight games and tied for the most ever. Most importantly, through eight games, Luck has the Colts sitting at 5-3 and in 2nd place to the tough Texans in the AFC South at the season’s midway point. If the season ended today, the Colts would be in the playoffs as a wild card team. They have also already more than doubled their win total from last season. Luck has become the second rookie in NFL history with four 300-yard passing games in his first year. The other was his predecessor, Manning. He also has four 4thquarter or overtime game-winning drives through eight games. The four other rookie QB’s have combined for four among them. Of course, it helps to have a world class talent like Reggie Wayne at his disposal. Wayne has 61 catches for 835 yards and three touchdowns on the year and more importantly, has given Luck that go-to receiver that all young quarterbacks need. Compared with the second overall pick of this year’s draft, Robert Griffin III, Luck has 2,404 passing yards to Griffin’s 1,993 and has two more touchdown passes. More importantly, Luck has two more wins than the electrifying Griffin, whose Redskins sit at 3-6 through nine games. The hype, the preperation and the execution all have the Colts in position to return to the playoffs this year. As Luck prepares to face the Jaguars tonight, he can help his team take a giant step towards that goal. A win would improve the team to 6-3 and more importantly, to 2-1 in the division. The Colts travel to Jacksonville to take on the Jags at 8:20 pm.